Operating frequency 5, 15 kHz. 3, 15 kHz. 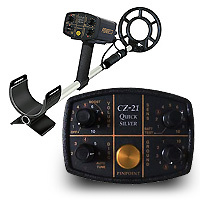 The CZ-21 is an excellent and easy to use metal detector. Once you learn to use it, you will do very well. It is easy to ground balance and it can be rod, chest, or hip mounted with no problems. It is waterproof down to 250 feet and comes with a straight rod mount that can also be used for diving. The detector, when used in the AutoTune (a wide scan all metal mode) setting is very sensitive, and its 3 tone ID makes detecting a pleasure. If you want gold, dig the mid tones. If you are hunting for coins, dig the high tones. If you hear a low tone - it is probably iron. A low/medium means a possible gold target next to iron. The detector will have trouble finding tiny gold necklaces or tiny chain link bracelets unless they have a clasp, but then the other brands of water detectors also have difficulty in finding such targets. Be sure to swing the detector coil slow in the water and you will have great success. The pinpoint button takes some getting used to, but after a while in the water you will not even bother using it. 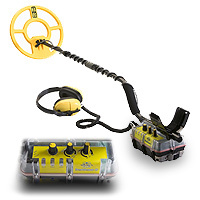 Overall, the CZ-21 is an excellent and well built detector that can be used on land or in the water. And, it is proficient in both ocean and fresh water as well as on dry or wet sand. I own/have owned several top of the line water detectors and am liking White's Beach Hunter ID more each day! While it is not quite as stable as others, I tend to find things with it! It seems to have lots of sensitivity. So running the sensitivity too high is a mistake at times. I have found dimes up to 11 inches! I think the 9.5" coil is just right. However it should be a weighted spider coil design for better water hunting. The headphones are top quality and comfortable. The detector is well balanced and feels light. I do not like the all metal/disc/reset toggle switch as it pops out of all metal at the slightest touch. White's confirmed that this is the way they are. Well, I say choose a better switch White's!!! I also do not like the battery closure device... a thin rubber O-ring that tears. I think White's can do better than that! Best of all I love the light and tone I.D. All of the gold rings I have found give the same nice medium tone and a yellow light. Each time I get a solid medium tone and yellow light while hunting, I get excited and start seeing gold! So I guess this detector excites me and makes detecting fun! I also like its bright yellow cheerful color. Somehow it makes me feel better! Perhaps it reminds me of gold?! Just dig all those yellow and blue signals... some gold rings close to the coil give a blue light/high tone. If you want one, buy it! Good Hunting!